Which pope and when established the ceremonial opening of the Jubilee? And in this Holy Year which this rite was shortened? Which Jubilee gave rise to the Jubilee pilgrimage to the Seven Churches? To know all these curiosities you can visit, until July 31, the exhibition "Holy Pilgrimage"
Organized by Opera Romana Pilgrimages at its prestigious headquarters building Maffei Marescotti (which housed the offices of the Vicariate of Rome from 1905 to 1963) in Via della Pigna, this is a unique opportunity not be missed: for the first time you can read and see the seals of 23 ordinary Years Saints: from the first, proclaimed in 1300 by Pope Boniface VIII, to the Great Jubilee of 2000, celebrated by St. John Paul II. Exceptionally it is also exposed the seal of indiction of the Extraordinary Jubilee of Mercy, signed by Pope Francis. 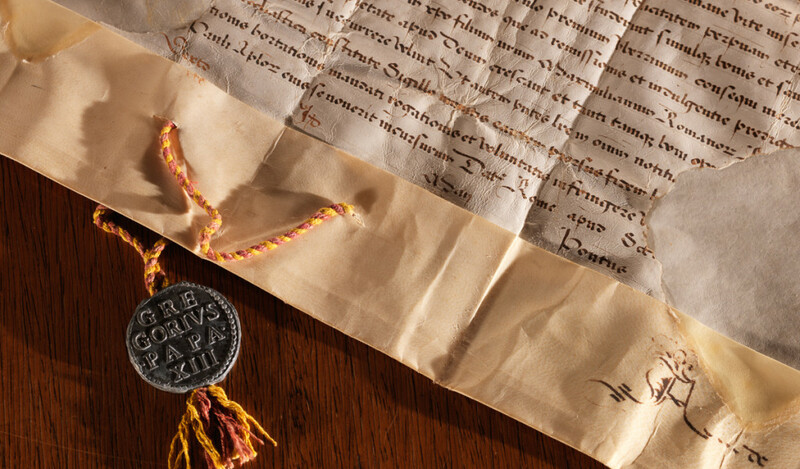 All of these valuable and historical documents come from the "private" (exactly the meaning of the Latin adjective "secretum") of the Popes, with some exceptions. Therefore these were never before shown to the public. The idea came to Bishop Sergio Pagano, prefect of the immense Vatican Secret Archives and curator of the exhibition, truly staged after the publication by the same prelate, a massive study of the papal seals of convocation of the Holy Years, now the catalog of the same exhibition. He was responsible also of the happy intuition for the choice of charming home, thereby allowing these precious documents remained in Vatican territory, given the extraterritoriality enjoyed by even the palace of the Old Vicariate, comply with the Treaty concluded between Italy and the Holy See in 1929. Share the post "A ROMAN EXHIBITION ABOUT JUBILEE SEALS"